Technological advancements that have been happening over the last two decades have significantly changed the way people communicate. It all started off as an effort on the part of the government to smoothen out communication issues related to national security, but today it is a worldwide phenomenon. The World Wide Web or the Internet links people around the world and makes available a whole lot of information to them. In fact, it can be considered as the pillar of modern day communication and it is likely to be the nucleus of all of the developments in the future. For modern day businesses of all sizes, telecommunications infrastructure has a key role to play. In fact, an affordable and reliable telecommunication service is the fundamental requirement of any business. Companies always look for reliable telephone lines and stable Internet connectivity as access to high-bandwidth telecommunication systems is essential for their day to day operations. The cabling system is the backbone of the IT network that is used for complex data processing work. Professionals at Zerone have the expertise and experience in designing and commissioning secure, robust, and sophisticated structured cabling systems for carrying high-speed data, voice, and video traffic. Cabling solutions offered include Copper, Fibre, Datacenter, and Intelligent Infrastructure systems. Ultimately, the goal of providing structured cabling is ensuring 100 percent accurate, trusted, and real-time connectivity and incorporating asset information within the configuration management database (CMDB) so as to enhance the utilization of all related IT service management process and tools. Structured cabling solutions come with 25 years’ warranty from manufacturers as Zerone has a direct partnership with leading manufacturers such as BrandRex and Schneider. The demand for high-quality bandwidth is on the rise. This is because businesses are required to communicate with their counterparts and customers across organizational and geographic boundaries through video conferences and other means. Moreover, mobile employees need secure and global access to the network. Further, virtualization and cloud computing technologies are significantly impacting network requirements. Therefore, the need of the hour is a converged network that supports data, voice, video, and storage so that the expensive multiple disparate networks can be done away with. This results in a reduction in complexity and cost and an improvement in flexibility and performance. As the premium partner of Alcatel Lucent, Zerone’s network infrastructure solutions include data centre, LAN, and WLAN switches; WAN routers; and WLAN access points and Management Software. Zerone helps you to reduce your communications costs by offering Alcatel-Lucent’s feature-rich IP Telephony solutions and enjoy maximum safety and security. Developed to work for communications, data network, and wireless, network management applications simplify the process of network devices management as they make available a set of tools and components. The network management system enables managers to track network activity, configure and troubleshoot devices, and manage the entire network from one platform. As these systems come with true client-server architecture, they allow multiple users to simultaneously access the services either through web browser applications or a Java-based client. Further, the applications ensure industry-best value for money for customers through unified and automated provisioning by way of a single interface and few parameters. When it comes to customer satisfaction, the quality of the products and services offered by you is just one part. The other part is the customers’ ability to contact you quickly and easily and how best you can maintain relationships. Now, partnering with Zerone Technologies enables you to get across to the right people at the most opportune time. This way you can reduce the wastage of time due to physical travel and missed calls. Collaborative conversion solutions help you to reach out to even remote places and remain connected even if you are travelling. The modular and complete contact centre solution “Open-Touch Customer Service Suite” enables businesses to unify all their communication media over the entire organization. Built on a platform that is open standard compatible, it allows you to manage all of the customer related activities in both the front and back-office systems. Reliable telecommunication services often provide good storage systems. The changes and developments taking place in the field of telecommunication have made it mandatory to alter the way storage systems are designed. As such communication service providers are developing new approaches that enable data storage at very competitive rates because of heavy competition, availability of new devices, and the introduction of new technologies such as cloud and analytics. When it comes to power solutions, Zerone Technologies offers increased output power packages, and energy efficiency to make sure that the work stream is not interrupted. In fact, Zerone’s systems secure telecommunication services if there are power fluctuations or interruptions. 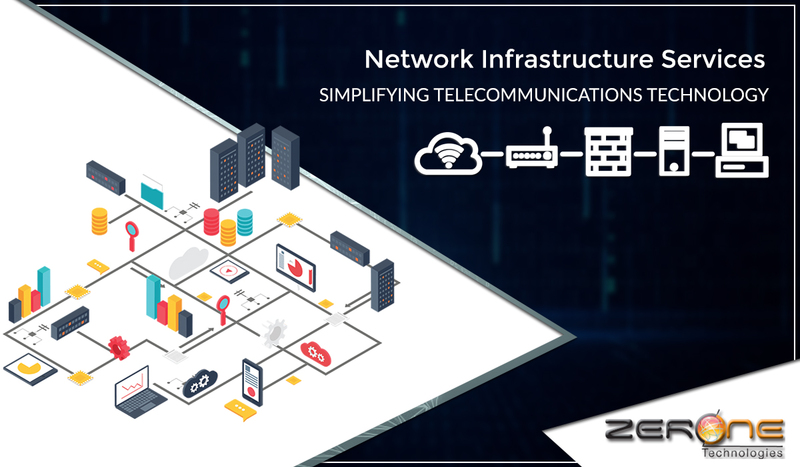 Summarizing, Zerone Technologies makes available high-bandwidth telecommunication systems through their infrastructure services.